Woods, trees, pale winter sunshine, billowing snow and flowing deep blue shadows sharp enough to cut raw gemstones... Not a single footprint disturbed the sculptural elements of the late winter landscape or the image captured. Just beyond the perimeter of the first photo are the tracks of fox, rabbits and wild turkeys, and it seemed to these old eyes that our resident fox had been spiral dancing across the hilltop this morning before we arrived. He(or she) didn't seem bothered by the deep cold at all and managed to look comfortable and even contented in the icy north wind. Oh beautiful, beautiful! I wish I was there! I took my walk amid ice and snow today, but your shadows and light and the beautiful wildling just speak to my heart. Thank you! Cate these are magnificent photos. The lines in this photo are really extraordinary. Amazing photograph! Lovely photo of the fox. It's odd how it still looks cold in the first photo even though the sun is obviously shining brightly, it's a beautiful sight but there is no feeling of warmth in there. Cold weather tends to sharpen the edges of photographs, animals and people. 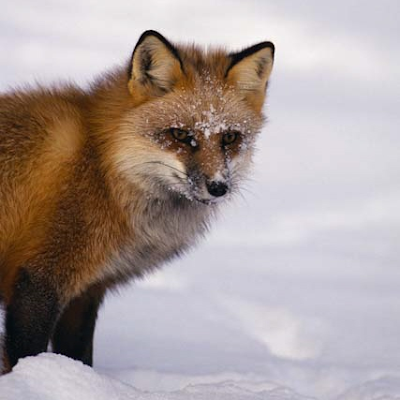 The little foxy face sprinkled with snow is gorgeous. I love the little red foxy person. 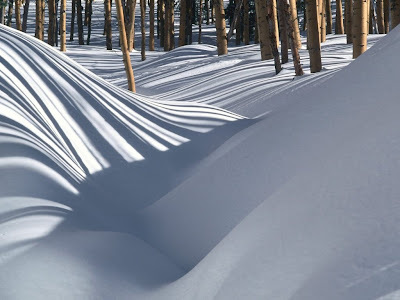 Magnificient - the snow, light and shadows - The image does not look real - looks like a painting. I look out my windows but cannot walk deep into the woods - getting too old!!!! I'm totally amazed at the fox photo. In my experience, they are not only sly, but shy! Oh! Your photographs are always extraordinary. But these two are just incredible. Thank you! I am not sure, but I think my fox is the little fox mother who raised a brood alone a few seasons ago after her mate was killed on the road. She was so thin that year that she broke my heart, and we brought her food all through the season. The den on the edge of hill looks as though it has been in use for many years. beautiful photo...I really love the long shadows of the trees on the snow! Somehow I missed seeing these photos the other day. They're wonderful. Really lovely. Are you selling prints of the image of snow and trees, by any chance? Lee, thanks for the kind words about my snowy "stuff". I shall look in my archive for the original of the snow and trees image - it was taken some time ago, but if I still have it, I shall play with it as a print and get back to you.